Beyond Blue CEO Georgie Harman receivs the $100,000 cheque from Zoetis Business Unit Director, Livestock, Fred Schwenke, (left) and Vice President, Australia and NZ, Lance Williams. 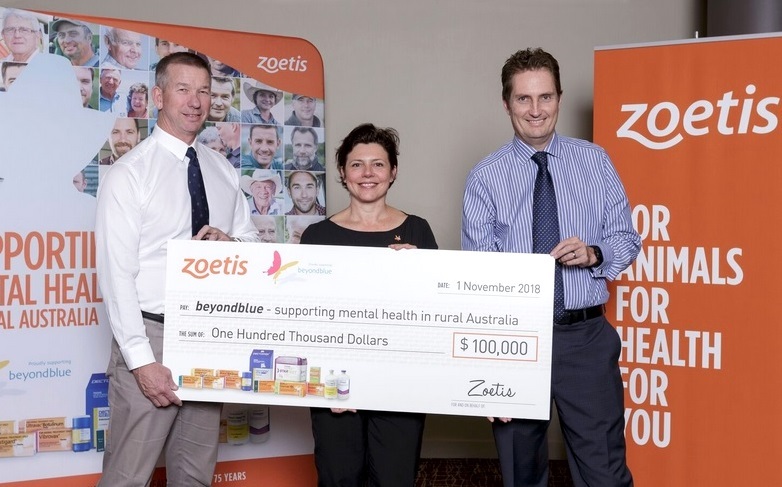 ANIMAL health company Zoetis has this year raised $100,000 for mental health in rural Australia through its partnership with Beyond Blue, bringing the grand total of money raised through the initiative to $300,000 since 2016. By donating $5 from each sale of its cattle, sheep, pig, poultry and goat vaccines and drenches, Zoetis has been able to reach its $100,000 goal for the third year running. The funds raised have gone directly to the Beyond Blue Support Service providing advice and support for people 24 hours a day, seven days a week. Beyond Blue CEO Georgie Harman thanked Zoetis staff and management for their efforts in supporting this important cause. “Our Support Service is there for people day and night – via phone, web chat or email – whenever they need someone to talk to. It is a potentially life-changing service for many people, especially those who don’t have friends, family members or support services close by,” Ms Harman said. The Beyond Blue service costs on average $48 per contact and people can reach out to counsellors by phone, webchat or email. This means to date the funds donated by Zoetis, with help from the local community, has helped 6250 people at a critical time in their lives. Zoetis vice president, Australia and New Zealand Lance Williams said his company was passionate about supporting hard-working Australians. In addition to the Support Service, Beyond Blue’s online resources and support can help people turn their lives around, regardless of where they live. More than 110,000 people use Beyond Blue’s online forums every month, tapping into an online peer support network. The Beyond Blue forums offer people connection and support from others who have been through similar experiences and can reduce the feeling of isolation and loneliness for many. The forums are monitored by a team of moderators who are trained to identify people at high risk of distress and suicide and help them to access the support they need. More than 1 million people in Australia experience depression and more than 2 million are living with an anxiety condition. More than eight Australians take their lives every day and there are an estimated 200 suicide attempts every 24 hours. Mental health professionals are available 24/7 at the Beyond Blue Support Service – 1300 22 4636 – or via beyondblue.org.au/get-support for online chat (3pm-12am ADST) or email (within 24 hours).